1. Say “I love YOU!” This is the first step towards forgiveness. If you don’t love yourself, you won’t love or forgive anyone else. 2. Say “I forgive” (fill in the blank). Say out loud the names of the people you need to forgive. 3. Write forgiveness letters and burn them. Write every person whom you need to forgive a letter and then burn it. Fire is a symbol of action and passion. By burning the letters, you clear out the old energy in your life. 4. Perform an act of kindness in the name of the person you need to forgive. Performing an act of kindness is a good way to build your karma. 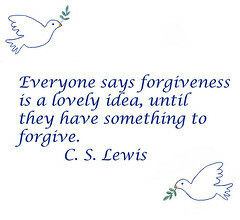 And, it’s a good way to forgive someone when you perform an act of kindness in their name. 5. Call the person you need to forgive. This one is scary because the person on the other end may not be open to hearing you say, “I’m sorry. Please forgive me.” Acknowledging your part in (fill in the blank) is the first step in freeing yourself from the burden you’ve been carrying. 6. Send an email. Sending an email to someone you need to forgive is just as scary as calling them. Keep your email brief and state that you’re sorry and ask for forgiveness. Yes, it’s important to ask forgiveness because you had some role in whatever happened between you another person. I know that’s a tough pill to swallow, but it’s the truth. 7. Volunteer. How can you forgive others? By volunteering at your favorite non-profit organization. Not only is giving back to your community a great idea, it’s a good way to forgive whomever you need to forgive. Helping others will make you see that people are doing the best they can. Sometimes mistakes in thinking and judgment are made. It happens. 8. Acknowledge that you need to forgive. Stuffing your feelings down with food, drugs, alcohol, shopping, etc. isn’t healthy. Realize that you need to forgive and take the necessary steps towards forgiving whomever you need to forgive. 9. Get angry. This may seem counter-intuitive, but getting angry can help you forgive. How? By releasing your emotions. Punch a pillow or go to the gym and workout. Let all of your anger out. When you’re finished, you’ll be able to see and think clearer. Own your involvement in the situation and forgive and move forward with your life. 10. Focus. Instead of focusing on “why” you need to forgive, just focus on forgiveness. 11. Remember: everyone is a spirit having a human experience. No one said living on planet earth would be easy. Obstacles may “pop up” here and there. Do your best to maneuver around them with grace. When you hit a bump, acknowledged it, and forgive. 12. Remember: we’re all connected. Yes, we are connected through an invisible force. Some refer to this as God, Universal Intelligence, Divine Intelligence, and countless other names. When you remember this, you’ll be able to forgive. Inhale through your nose and out through your mouth several times. Say the person’s name out loud or think the person’s name that you need to forgive. Say out loud or mentally, “I love you, I’m sorry, please forgive me, thank you” as many times as you need to in order to feel a feeling of forgiveness. This phrase comes from Dr. Hew Len who used the Ho’oponopono Hawaiian technique on himself and mentally ill criminals. Speaking up in a calm manner. Cutting ties with people who aren’t supportive of you. Taking the time you need to make educated decisions. Recognizing energy vampires and limiting the time you spend with them. 15. Open your heart. Nine times out of ten when a person lashes out at you, it’s about them and not you. Dr. Wayne Dyer says, “What other people think or say about you is none of your business.” Forgive others and help them when you can. 16. Choose to stop feeling the pain. If you keep reliving a situation over and over in your head, you’re allowing it to control you. The only way to forgive is to LET IT GO. What’s done is done. Move on, move forward with your life. 17. Call on your angels. No matter what religion you practice, you can always find some mention of angels. Ask your guardian angels to help you to forgive and then get out of the way and let them do their job. 18. Remember a time when you needed forgiveness. No one is perfect. You probably said or did something to someone and needed forgiving. Remember this the next time you’re hesitant to forgive someone. 19. Understand that you’re not the judge or juror of others. Enough said. 20. Don’t seek revenge. If you think getting revenge or teaching someone a lesson is effective, you’re wrong. The best revenge is to forgive. It’s a positive vibration, not a negative one. 21. Make a list of the lessons you’ve learned. The people in your life are teachers and mirrors for you. Write down the lessons you’ve learned and thank those who’ve taught them to you. Commit the lessons to memory and don’t repeat them. 22. Have compassion for you and the person you need to forgive. Don’t rush forgiveness. Feel your emotions and process them in a healthy way. Be gentle. Be kind. 23. Cry. Crying is a great release of emotions. Once you’ve cried your eyes out, forgive whomever you need to forgive. 24. Journal. Writing your thoughts down every day is an amazing healing tool. You’ll be able to forgive others and yourself by pouring your emotions onto the pages of a journal. Reflect on your writing and forgive. I forgive you. I forgive me. Out of this situation, only good will come. ~Louise Hay. 26. Untie yourself from the situation. Free yourself from others and situations by dissolving and releasing the ‘energetic’ hooks that are attached to you. Visualize white light pouring down on you and dissolving the hooks. Or, you can say, “I now release and dissolve any and all hooks that may be attached to me.” You may want to take a sea salt bath or take a shower and use a sea salt scrub to wash away the negative energetic residue. 27. Ask for help. If you’re still having trouble forgiving others after you’ve read this list, consult with your pastor, priest, rabbi, life coach, counselor, or a trust friend.